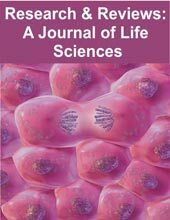 Research & Reviews: A Journal of Life Sciences (RRJoLS) is a print and online journal focused towards the rapid publication of fundamental research papers on all areas of Life Sciences. The aim of the journal is to enhance and disseminate scientific knowledge and principle. All contributions to the journal are rigorously refereed and are selected on the basis of quality and originality of the work. The journal publishes the most significant new research papers or any other original contribution in the form of reviews and reports on new concepts in all areas pertaining to its scope and research being done in the world, thus ensuring its scientific priority and significance. Research & Reviews : Journal of Agricultural Science and Technology (RRJoAST) is a print and online Journal focused towards the publication of current research work carried out under Agricultural Science and Technology. This journal covers all major fields of applications in Agricultural Science and Technology. Research & Reviews: Journal of Botany (RRJoB) is focused towards the publication of current research work carried out under Botany. This journal covers all major fields of applications in Botany. Research & Reviews: Journal of Crop Science and Technology (RRJoCST) is a print and e-journal focused towards the publication of current research work carried out under Crop Science and Technology. This journal covers all major fields of applications in Crop Science and Technology. Research & Reviews: Journal of Dairy Science and Technology (RRJoDST) is an online Journal focused towards the publication of current research work carried out under Dairy Science and Technology. This journal covers all major fields of applications in Dairy Science and Technology. Research & Reviews: Journal of Ecology (RRJoE): is an online and print Journal focused towards the publication of current research work carried out under ecology. This journal covers all major fields of applications in ecology. Research & Reviews: Journal of Food Science and Technology (RRJoFST) is a print and online Journal focused towards the publication of current research work carried out under Food Science and Technology. This journal covers all major fields of applications in Food Science and Technology. Research & Reviews: Journal of Herbal Science (RRJoHS) is focused towards the publication of current research work carried out under Herbal science. This journal covers all major fields of applications in Herbal Science. The scope of herbal medicine is sometimes extended to include fungal and bee products, as well as minerals, shells and certain animal parts. Research & Reviews: Journal of Physics (RRJoPHY) ) is a Print and online Journal focused towards the publication of current research work carried out under Physics. This journal covers all major fields of applications in Physics. Research & Reviews: Journal of Space Science & Technology (RRJoSST) is focused towards the publication of current research work carried out under Space Science and Technology. This journal covers all major fields of applications in Space Science and Technology. Research & Reviews: Journal of Statistics (RRJoST): is an International e Journal focused towards the publication of current research work carried out under statistics. This journal covers all major fields of applications in statistics.